Be updated on what’s trending at Facebook, Twitter and Google using your Sun Cellular prepaid SIM. 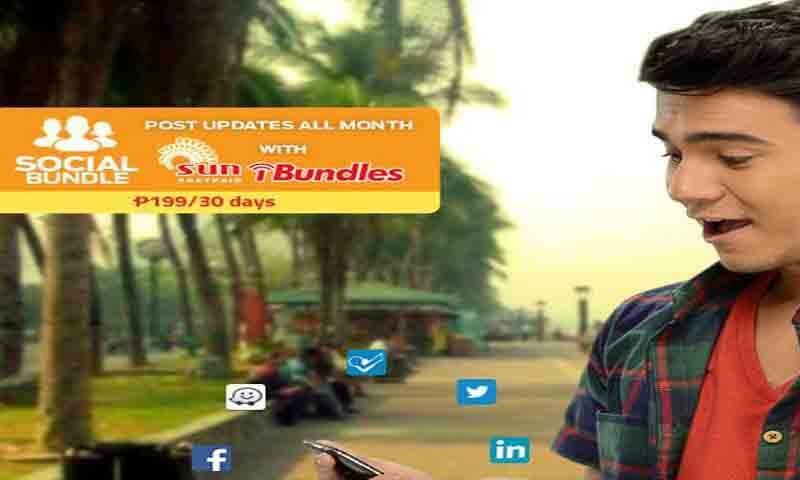 For only 199 pesos you subscribe to their social networking app promo bundles for 30 days. With SOCIAL199 from Sun iBundles you’ll enjoy affordable internet package that fits your lifestyle without hurting your monthly budget. This comes with 1-month access to Facebook, Twitter, Waze, Google Plus, LinkedIn and Path apps on your mobile phone. Subscription can be done via SMS using the keyword and access number. Just reload you Sun Cellular prepaid SIM amounting to 200 pesos then text the correct format to register on SOCIAL199 promo. Note: Make sure app mentioned above is already installed on your phone before you register to this promo, if not subscribe to iSurf bundles for all day internet access. To start, just turn on your mobile data, then use Sun APN in connecting to the internet. Before you start using this promo make sure you received an SMS notification confirming that SOCIAL199 is now ready to use. If you want more information and help regarding this you can text HELP SOCIAL199 to 2300 or call their hotline. This promo is available to all Sun Cellular prepaid and postpaid (add-on) users.